We were floating in the middle of the Potomac River on a bunch of stand-up paddleboards when my friend Buck made his sales pitch. The six of us, all beginner stand-up-paddlers taking Potomac Paddlesports‘ SUP 101 class with my ski-patrol buddy, Buck, an SUP instructor had spent the afternoon propelling ourselves up and down the river, soaking up the almost-summer sun and appreciating the wild, rocky beauty around us. Now, Buck was launching into what he called the “shameless self-promotion” part of the lesson, in which he told the class about memberships with Potomac Paddlesports. Photo credit: The Washington Post. My friend Buck is the one wearing the cool hat. He told the class about the Tuesday-night SUP meet-ups, which are followed by pizza and beer. He told them about the community of paddlers, stand-up and otherwise, they were all now a part of. 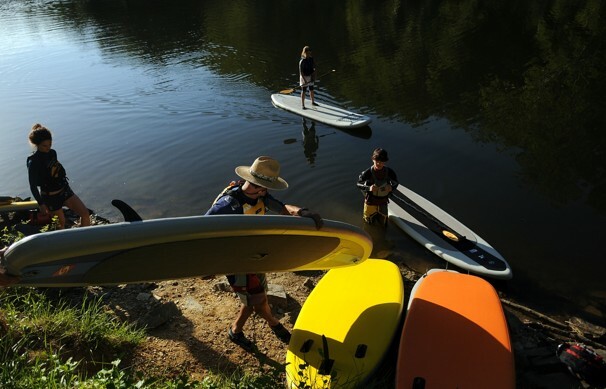 He told them about how he sees himself as an ambassador for the sport, and how every class member is a pioneer of the Potomac simply by practicing it there. I looked around at the other students, all first-time SUP’ers. They were all beaming, looking pretty stoked themselves. I grinned, too, at the beauty of the afternoon, and of the image of all of those students going home to significant others to announce their new obsession, and to let them know not to plan on seeing them for Tuesday-night dinner for a while. I know how they feel—I’ve been anxious to get back on a paddleboard ever since Buck first introduced me to the sport last fall. It got me thinking about the idea that whether or not we’re officially selling memberships, we’re always serving as unofficial ambassadors of the sports we love, simply by the look on our face when we talk about them, and the stoke that (hopefully) emanates from us when we’re practicing them. Sometimes, the ambassadorship is explicit, like Buck’s sales pitch, or like the time Steve and I planned a ski trip for our runner-friends, most of whom hadn’t skied before. We obsessed about the details of that first trip, arranging lessons and emailing long “what to pack” lists so everyone was prepared. We loaned out ski pants and helmets to friends in need of gear, and generally tried to make entry into our favorite sports as easy as possible. Most of the time, our ambassadorship is more oblique. I’m willing to bet the thing that really got our friends excited about skiing was the way we bounced out of bed every morning in our eagerness to hit the slopes, or in the way we couldn’t stop giggling at the end of the day as we recounted tales from the ski day we’d just enjoyed. Sometimes, being an ambassador means simply practicing your sport, and keeping up your stoke about it. I don’t mean to say that we should be falsely chipper after we have a tough race, or when we’re not feeling so superbly motivated. I just mean that when we’re feeling the love, we should make sure to share it. How do you serve as an ambassador for the sport you love? Have you helped friends new to running choose running shoes, or new cyclists find a bike that fits them? Paced a friend through his or her first half-marathon? SUPIng, Crossfit, Swimming, Yoga, Tabata, I think this website and the person who runs it is a pretty good ambassador to a bunch of different sports, you rock! I can’t help but giggle when I read about “Buck.” Tell him I say hi next time you SUP. Hubz and I are going to have to go try this! !